A 2010 Paso Robles High School graduate and Paso Robles native is serving aboard a U.S. Navy attack submarine, the USS Texas (SSN 775). 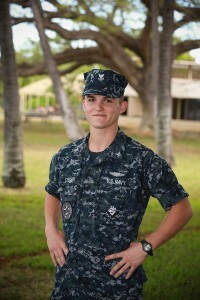 Petty Officer 2nd Class Ruben Chechik is a machinist mate aboard the Hawaii-based boat, a Virginia-class nuclear-powered attack submarine, and the first submarine to be named after the Lone Star State. Measuring 377 feet long, 33 feet wide, weighing 9,000 tons when submerged and with a complement of more than 130 sailors, USS Texas is one of the Navy’s newest and most technologically sophisticated submarines. Attack submarines are designed to pursue and attack enemy submarines and surface ships using torpedoes. They also carry cruise missiles with conventional high-explosive warheads to attack enemy shore facilities, conduct intelligence, surveillance and reconnaissance missions, mine laying and support special operations. As a young sailor who needed money for school, Chechik said he joined the Navy with his cousin. Texas, along with all other U.S. Navy submarines, is manned solely by volunteers from within the Navy. Because of the stressful environment aboard submarines, personnel are accepted only after rigorous testing and observation. Submariners are some of the most highly trained and skilled people in the Navy. Although it is difficult for most people to imagine living on a submarine, challenging submarine living conditions actually build strong fellowship among the crew. It is a busy life of specialized work, watches, and drills where sailors learn to rely on others, and learn they must be relied upon themselves. Chechik said he is very proud of the work he is doing as part of the Texas’ 130-member crew, protecting America on the world’s oceans. Imagine working and living in a 377-foot long, 33-foot wide, three-story building with no windows and surrounded by technology. Then lock the doors, submerge beneath the surface of the ocean and travel silently underwater for months. As a member of one of the U.S. Navy’s most relied upon assets, Chechik and other USS Texas Sailors know they are part of a legacy that will last beyond their lifetimes. thank you for your service, Ruben, we are so proud of you !! I’m always so thankful for our young warriors willing to do the hard work so we can live safe. God bless and safe sails. Oh and it looks like he’s qualified and got his “fish” too! Thanks for your service Ruben! I bet we could look at solid parenting from this young mans life. What a great example he is of our youth and the giving back to our country, Thank you Petty Officer 2nd Class Ruben Chechik. Thank you for your service Petty Officer 2nd Class Ruben Chechik. God bless you and keep you safe. May you have fair winds and a following sea..